Average Height	: 11" - 12"
Average Weight	: 15 - 30 lbs. The French Bulldog originated in 19th Century Nottingham, England, where lace makers decided to make a smaller, miniature, lap version of the English Bulldog that was referred to as a "toy" bulldog. In the 1860s, when the Industrial Revolution drove the craftsmen to France, they took their dogs with them. When the workers of Nottingham moved to France in search of work, they brought their smaller bulldogs with them because they were suited to the cramped living conditions, and were excellent ratters. The toy bulldogs became popular in France and were given the name the "French Bulldog." In the 1860's, the export of miniature bulldogs became so popular, that they practically became extinct in England. They were then thought to have been crossed with a native breed, the Terrier Boule , and eventually giving rise to the French Bulldog. It soon became a star of the working class Parisians society. Their physique, small size, and enchanting personality, soon made this little petite Boule the darling of flat faced breed fanciers. As the new smaller breed bulldog gained in popularity in France, they quickly gained favor with the "ladies of the night". The French Bulldog made its first appearance in the united states in 1896 at the Westminster Kennel Club show in New York. In England, the French Bulldog Club was formed in 1902. The Brits were not happy with the name "French" given to a dog that was originally from England, however the name "French Bulldog" stuck. •	Loving companions, gentle, thriving on human contact. •	Great dogs if you work at home and need quiet company. •	Can be mischievous 'goof balls'. •	Easy to train, but can be stubborn. Firm, patient training is needed with this breed. •	Drool, 'back-fire/flatulence' and shed. •	Can be difficult to 'housetrain'. •	An indoor dog, that does not thrive well being left alone ~ and can develop 'separation anxiety' if forced to be alone for extended periods of time. •	Excellent watchdog ~ French Bulldogs will alert their owners of approaching strangers, but otherwise not really known to be 'barkers'. A quiet breed. •	Do well in apartments/condos...do not need a lot of room/space. •	As a non-barker ~ make a great apartment dog. •	Do not need a lot of exercise ~ 15 minutes walks every day will be fine. •	Susceptible to becoming overweight if over-fed and not exercised. •	Can suffer from heat exhaustion, they prefer air-conditioned environments. •	Do not do well left outside in hot weather. The French Bulldog is compact, sturdy, and heavily boned. He is short and cobby, with a small to medium build. The height at the withers, should be approximately the same as the length from withers to tail-set. Massive chest, with tapering hindquarters. 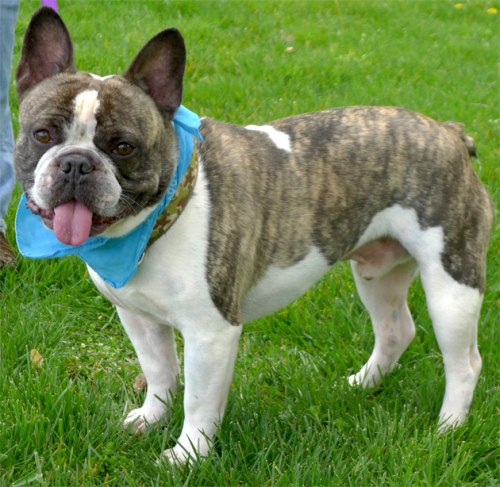 French Bulldogs have large, rounded bat-like ears, square flat heads with a slightly domed forehead, large rounded eyes, and flat muzzle. French Bulldogs are a smooth coated breed. The French Bulldog has the appearance of an intelligent, alert, active and curious nature. Frenchies are hardy and robust little busy-bodies. The French Bulldog can have a corkscrew tail or a straight tail. Although bred as a companion , they can also make a good watchdog, and will sound off at any potential sign of danger to their families. The French Bulldog is an extreme lover. They are affectionate, playful and demanding of attention, from all that he comes into contact with. He does not do well left alone in a backyard. A Frenchie needs the constant companionship of his family. They make an excellent companion for children, although very small children may not tolerate his over enthusiastic nature. They generally gets along well with other animals, as long as they are of as playful a nature as he is. They are generally not given to excessive barking. They will protect their homes and alert owners to intruders as well as when people are at the door. They do not sound vicious, but do have a deep bark. Most Frenchies tend to sit back and let others make a commotion. They are often referred to as "little clowns," and a more fitting description could not be found. The Frenchie is at his utmost content when he is being showered with affection. he will return the favor to his utmost capabilities. He is a true lapdog, an extreme lover, a bodyguard, a playful companion, and a true "best friend". The French Bulldog requires minimal grooming. A weekly brushing should be done to remove the loose hair, and stimulate the oils in the skin. This will help prevent the skin from becoming dry, flaky and itchy. A once a month bath with a mild soap is all that is needed. Too much bathing can dry out the skin. Nails should be kept trimmed, and the pads of the feet checked often, to ensure that there are no cracking. Frenchies have folds that also need to be kept clean. Gently lift the folds and swab the area with a cotton swab, to be sure that it does not become a breeding ground for bacteria. The ears should be kept clean to avoid infections. Check the ears daily by looking inside them. Make sure they are pink, then gently swab the inner ear with a damp cotton swab. If you notice any symptoms such as a foul smelling odor or discharge, contact your vet for advice. Never push cotton buds deep into the ear canal. The eyes should be clear. If a discharge is noted, gently swab the eye area. If the condition persists, contact your veterinarian, to be sure that there are no developing problems. The French bulldog is not the breed to run along side you as you are jogging. They enjoy short walks when the air temperature is moderate. Never expose a Frenchie to higher heat as they are prone to heat stroke. They do well with a short walk and a long nap to follow. They are heavy headed and do not swim. Frenchies have been known to drown when left unattended near water sources. Lakes, rivers, pools, etc, should be considered a danger to your French bulldog. they should always be closely guarded when near a swimming pool or lake. although Frenchies love to play, playtime must be limited . They will tend to over exert themselves, and breathing becomes difficult for them. French bulldogs require a "downtime" after and form of exercise. This is an excellent time to calm and cuddle them. They will never turn down any form of affection. French Bulldogs can be stubborn and hard headed. They are not easy to train, and have a hard time learning to act on command. You must be more stubborn than your Frenchie ! Some people suggest crate training as the best source of getting the lesson learned. You can expect four or more months of consistent crate training. Frenchies do not like to take orders. They have a hard time adhering to the task at hand and are easily distracted. Owners of this little bully breed , should have a strong will and an endless supply of patience. Learning to obey basic commands is something that must be taught with this breed. Puppy classes are a good way to socialize Your puppy as well as learning the basic social skills needed in developing a good relationship with your French Bulldog. A Frenchie with bad manners, does not make for a pleasant companion. Males should be neutered if they will not be bred. This helps with the task of housebreaking. They need to learn that it is not acceptable behavior to jump on houseguests, Inspect the contents of the trash can, or use the dirty laundry as they do their chew toys. Teaching them at an early age will have far greater results and can make living with your Frenchie a pleasant and rewarding experience. There happy go lucky personality is a plus for training. Some common Health Problems in the French Bulldog are respiratory and eye problems. If they become overweight, they can have trouble with their breathing. This is caused when the abdomen becomes swollen and pushes on their lungs. They can also be gassy, snore and wheeze. Females may have to have a caesarean for the birth of the puppiesbecause the puppy's heads are rather large.